30 new yellow taxis, in an effort to ease the traffic shortage in downtown center, has welcomed by local residents and tourists after their trial operation on the roads during National Day holiday. The operating of yellow taxis has been good in all aspects and yet we have not received service complaints, said the taxi company director. The remaining 70 taxis are expected to run on the roads by Oct.20. After the yellow taxis drove into the centre, giving a relief of taxi shortage for passengers, a new problem occurs among tourists and residents that the inconvenience for attraction destinations. 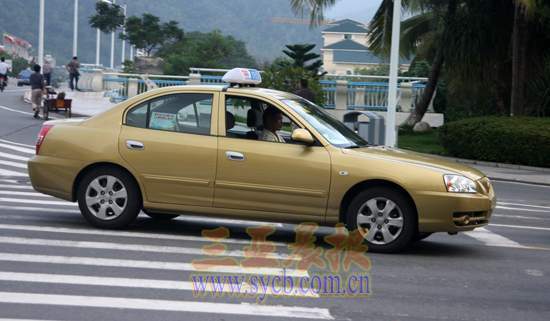 Currently, the 100 new yellow taxis are allowed to run only within specific areas in the city such as Phoenix Road, Sanya Bay Road, Dadonghai Square, the Phoenix Airport and railway station.